Cut away the fluff and distraction, and focus on getting better at these 6 essential movements. This is bare-bones training done right! Walk into the gym, and you instantly have exercise options too numerous to count. Heck, you'll find a whopping 135 different shoulder exercises on this site alone! So...which one do you do? Plenty of people go the "as many of them as possible" route, but that takes a major time commitment and the willingness to train for an hour or more nearly every day without exception. The rest of us—those who want to spend our time playing sports or just, well, playing—have to be more selective. Whether you're looking for the ingredients for a perfect total-body workout, or you'd just like to cherry-pick a move or two to insert into your current routine, this list of essential exercises has you covered. Get stronger at them, and you will get stronger, period. Use them in a muscle-growth rep range of 8-12 reps per set, and you will get more muscular (provided you're eating enough). Seriously, training doesn't have to be complicated. Get better at these six movements first, and see how far they can take you! This is a quintessential move, and not just for powerlifters. Research shows that the pectoralis major is activated significantly more during this exercise than moves like the fly, push-up, and cable cross-over.1 But here's the thing: Have someone show you how to bench correctly, and you'll feel it in far more than your chest. Your upper back, legs, and even glutes are getting worked. "It requires movement at the glenohumeral and ulnar-humeral joints, which means more muscles have to be involved," says Michael Urti, CSCS, from Retro Fitness in New York City. "Plus, the barbell must be stabilized to execute the movement properly, which activates even more musculature. Your whole body, from head to toe, is working together to move that weight." 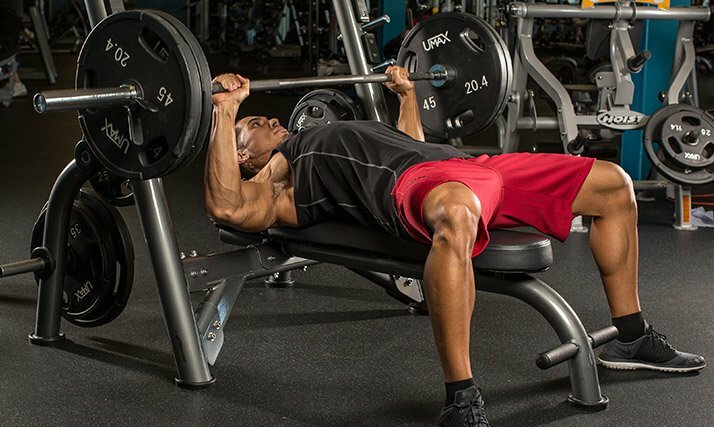 Have someone show you how to bench correctly, and you'll feel it in far more than your chest. Your upper back, legs, and even glutes are getting worked. Unfortunately, there's a lot that can—and does—go wrong with this perfect movement. "I always see people in the gym gripping the bar too wide, which increases the risk of shoulder injury," says Urti. He also stresses the importance of squeezing your pecs hard during the peak contraction. "People often limit their range of motion to crank out more reps or give the illusion that they can lift more weight," he explains. "But that diminishes the effectiveness of the move." You're going down low enough if the bar grazes your chest, but it shouldn't bounce. Some people will tell you that a bench press isn't "functional," but we'd counter that the strength and muscle it will produce definitely are. So do it, and don't apologize for it. You know the squat is a killer leg move just by the uncontrollable shaking you experience afterward. "Because there's so much neuromuscular activation when performing this exercise, your body's hormonal response is heightened, which is ideal for strength gains and fat loss," says Urti. The squat is too important to do wrong. Have someone who knows their stuff look at yours and give it an honest assessment. If your hips or shoulders are keeping you from being able to do a quality squat, work on your mobility there and do front squats or goblet squats. It's a classic gym image we've all seen: Arnold (or someone like him) struggling to curl a huge loaded barbell. Sure, it looks cool, but for most of us, a far better choice is right over in the dumbbell section. "Using a barbell allows you to lift heavier weight, but it can also lead to muscle imbalances if the stronger side takes over," says Parker Hyde, MS, CSCS, a doctoral candidate at The Ohio State University. "Using dumbbells can help (or prevent) strength and muscle imbalances and give you enough stimulus for muscle growth." As many lifters can tell you, barbell curls—particularly with a straight bar—can also wreak havoc on your wrists. Not so with dumbbells. "Dumbbell curls also allow for a more natural movement, as well as a greater range of motion," Hyde says. "They give you the option of varying your hand position. Each position alters the activation of the different heads to slightly different training stimulus." To get the most out of every rep, select the right load. "The biggest mistake guys make is going too heavy," adds NYC-based trainer Gerren Liles. "Choose a weight that doesn't require you to swing and use momentum to lift." Add LeanBCAA to burn fat and build lean muscle! Preserve your gains and burn calories with EVL LeanBCAA, only on Bodybuilding.com! Go Now! One of the classic rules of the weight room—one that gets forgotten all too often, unfortunately—is to pull as much as you push. In other words, for every pressing motion, like a bench or overhead press, make sure you include a pulling motion, like a row variation. So why this one, rather than, say, a bent-over barbell row? The barbell row is a great movement, but for many lifters, it works the lower back as much as the upper one, so your lumbar cramps up and craps out long before your upper back and shoulders get worked. This chest-supported row variation simply checks off a ton of boxes without that basic flaw. Along the way, it strengthens crucial posture muscles like the traps, rhomboids, and lats, as well as the perennially neglected rear delts. 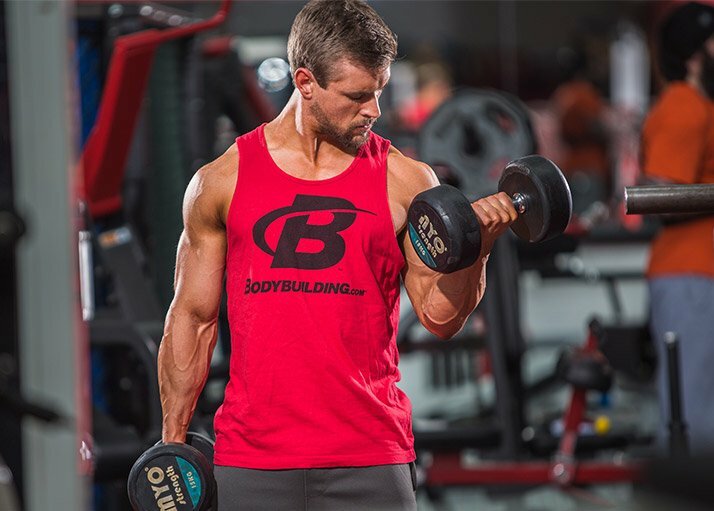 In fact, when researchers at the University of Wisconsin-LaCrosse compared the muscle activation of eight different shoulder exercises, they found that the 45-degree incline row stimulated more activity in the middle and posterior heads than other popular exercises like dumbbell raises and upright rows.4 If our goal is to pick the exercises that offer the most bang for the buck, you could do a lot worse than this one. Why does this matter? The front or anterior head of your delts will getting plenty of work in overhead presses, bench presses, and even curls. The other heads need love, too. "If one head is stronger than the other, it can look odd," says Joe Kekoanui, CSCS, the owner and head coach of Huddle Relative Sports Training in Philadelphia. "Plus, muscle imbalance can lead to injuries down the road." The genius of this exercise lies in the forward lean. "You're lifting a weight as you work against gravity," says Kekoanui. Just remember to watch your tempo. "Do a row, controlled row. Jacking or exploding through the motion with too much weight can diminish the workload on the intended muscle and put you at risk for injury." Standing barbell presses should be a staple of every lifter's shoulder routine, says Hyde. "They require upper-back and rear-delt stabilization and core activation, as well as strong legs. EMG research suggests that during a standing barbell press, as compared to seated dumbbells, there's significantly greater muscle activation of both the middle and front delts.3 This is important, since these are the two primary muscles that really create those cannonball, capped delts." EMG research suggests that during a standing barbell press, as compared to seated dumbbells, there's significantly greater muscle activation of both the middle and front delts. The only downside to the overhead press? It demands a lot of mobility, both in the upper back and shoulders. If you're not up to the task yet, stick to the dumbbells and work on your mobility until you are. A functional, pain-free overhead press is a goal worth working toward, and it'll pay off big time when you get there. It's hard not to obsess over the muscles on the front of your body, since they're the ones you see most. But neglecting the flipside sets you up for strength imbalances, upping your injury risk. Check multiple posterior muscles off your to-train list in one heavy hit with the deadlift. "It improves strength and power production in your hips, which is transferrable to many activities," says Liles. What's more, your back works hard to stabilize your upper body while you move. Unfortunately, this exercise is easy to screw up, which sets you up for possible injury. To get it right, maintain a flat back for the entire movement, and let the bar graze your legs as you descend and rise up. As with the squat, get feedback on your form from someone who knows what proper form looks like, or film yourself. "Barbell deadlifts demand you maintain proper spinal alignment, but this is a skill that's essential to learn if you want to be safe in the gym, period. It's worth your time to learn," says Liles. "But if you're just starting out or have back limitations, it's OK to use a hex or trap bar instead of a barbell. You'll still work the posterior chain with far less stress on the lumbar spine." If the conventional deadlift (where your knees are inside your arms) doesn't feel or look right for you, don't worry: You have options, such as sumo (legs outside the arms), rack pulls from knee level or lower, or even single-leg deadlifts. They're all great choices, and the end result of mastering them will be, as with all these lifts, full-body strength and muscle to make you better at, well, everything! Schanke, W. (2012). Electromyographical analysis of the pectoralis major muscle during various chest exercises (Doctoral dissertation, University of Wisconsin—La Crosse). Vingren, J. L. (2012). Hormonal response to free weight and machine weight resistance exercise (Doctoral dissertation, University of North Texas). Saeterbakken, A. H., & Fimland, M. S. (2013). Effects of Body Position and Loading Modality on Muscle Activity and Strength in Shoulder Presses. Journal of Strength and Conditioning Research, 27(7), 1824-1831. Jeanine Detz is a certified trainer and has been a health and fitness writer for more than 15 years.